Today I want to recognise a few of the unsung heroes behind the scenes here at ‘The Human, Earth Project’ – the interpreters and translators who have made ‘Sisters For Sale’ possible. ‘Sisters For Sale’, our feature documentary, tells the story of the search for my kidnapped friends in Vietnam and China. Not only did this search involve investigating extensive criminal networks, but doing so in regions where I couldn’t even speak the language. While I was fortunate that the central figures in the film all spoke English, others did not, and I could never have done it alone. The search itself, and the later translation of footage for the documentary, was made possible by an amazing group of people, including some very good friends of mine. Some of these people I’ve been working closely with for years, others have contributed just a few lines of translation, and I’m deeply grateful to all of them for their time, energy and talents in making this happen. Giang Thi Chan and Giang Thi Chu worked with me during the investigation, appearing as interpreters within the film itself. My friend and human trafficking survivor P also assisted with interpretation. Acquiring more precise translations of the Hmong language proved especially challenging, as the dialect spoken in the film is very regional, and local literacy levels are low. Another Hmong friend, who has chosen to remain anonymous, spent a great deal of time working with me in translating interviews more fully. Further Hmong translations were made by Giang Thi Vu, Hang Thi Dinh, Suong Mai and Vu Thi Bao Ngan. 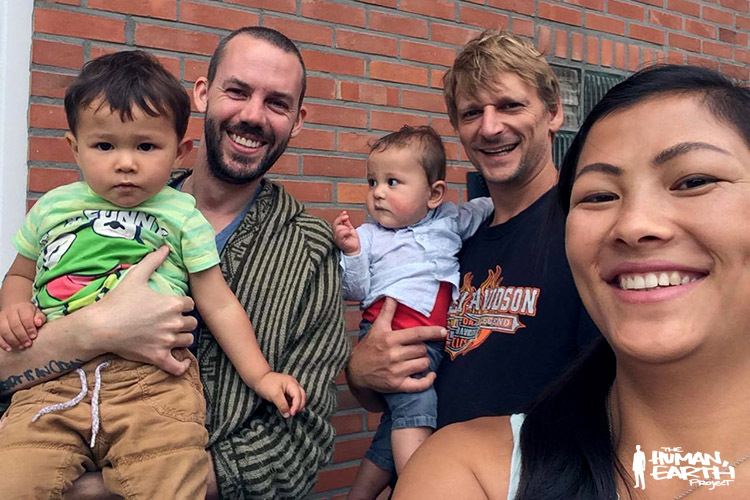 This summer, I met with Lo Thi Mai and her family at their home in Belgium, where Mai worked with me on the final Hmong translations and corrections for the film. But English and Hmong are not the only languages in the film. From the very beginning of ‘The Human, Earth Project’, Qiuda Guo has been of immeasureable assistance with the Chinese language, culture and local knowledge. Nicole Zhao and Yuqing Zhang have assisted with more region-specific Chinese parts, while my good friend Catherine Irwin-Gibson provided translations from French. Translating everything into English was the first step – the next is making ‘Sisters For Sale’ accessible to a broader international audience. Ultimately, I’d love to have the documentary subtitled in numerous languages, including Chinese, Vietnamese and Hmong itself – for the moment, I’m focusing on some of the major European languages. Jaen Nieto Amat, Natalia Glargaard, Johanna Leiner and Maria Julia Ravera worked on the French, German and Spanish translations of the ‘Sisters For Sale’ trailer. Last month, we embarked on the most ambitious translation project to date: producing our very first foreign translation of the entire documentary, in French. It was a huge job, involving 1,529 individual subtitles, 26 name titles, 9 titles for the beginning and the end of the film, and 7 animations. I personally spent over 47 hours working on it – and I wasn’t even doing any of the translations! We had a fantastic translation team, including some close friends who have been involved with the project from the very beginning, and some new faces: Leila Azul, the unstoppable Alexandre Boulianne, Anna Bromwich, the merveilleux Mireille Maheu, and Emmanuelle Vallières-Léveillé. The work was supervised by the professionally-qualified English-French translator Elisabeth De Sa Barbaro, who was an absolute rockstar. Our next translation project will be making ‘Sisters For Sale’ available to the Spanish world – if you know anyone who is fluent in both English and Spanish and wants to get onboard, let me know! I’d like to thank all the women who responded to the question I posed in my last blog post, and via Facebook – answers are still coming in, six weeks later! I was fascinated by the spectrum of thoughts and feelings on what it means to be a woman in the 21st century. The explosion of the #metoo campaign on social media last month helped highlight some of the challenges women face every day, and just how much work remains to be done, even in more progressive cultures. It’s been a strange time for ‘The Human, Earth Project’, with several of the people closest to the project facing challenging times. The project has been spinning somewhat off-centre, and things have been progressing more slowly than expected. The documentary itself is awaiting music and a final sound mix, and is coming soon! In late September, ‘Sisters For Sale’ was featured in an article by Jacek Pawlicki on the sale of young women from Vietnam into China, which was published in Newsweek’s Polish edition. Earlier this year, I finally had a chance to read ‘The Shut Eye’, a fantastic crime novel by Belinda Bauer, which cites ‘The Human, Earth Project’ as an inspiration. If you’re in the UK, for this week only you can grab a copy of ‘The Shut Eye’ for just 99 pence here.